The model for this painting, Carlos, approached us to do a body painting to tell his tragic life story. When Carlos was 17, his mom got his dad killed because he was about to leave her for another woman. Recently, his mom was released from the prison. This event brought back old wound and made his feel dissatisfied with the justice system. Carlos wanted the body painting to grab people’s attention so he could tell them about his story, which he hopes would inspire them to also fight for justice and recovery in their own lives. The image that we chose was the bleeding Christ who also suffered injustice, but ultimately defeated evil with good and brought life to many. 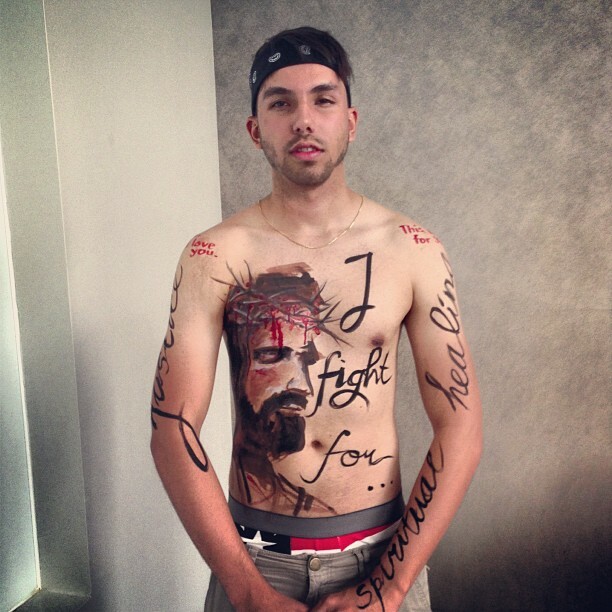 In addition to the image of Christ, we added few text: “I fight for…” on Carlos’ torso, “justice” and “healing” on his left and right arms, and “What do you fight for” on his back.